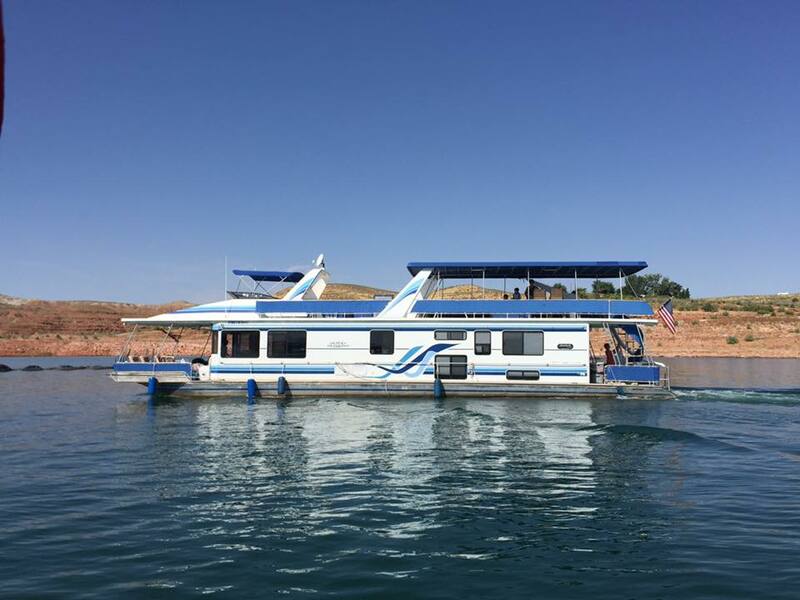 Every summer for the last 19 years, we spend a week or two on the houseboat. It's the very best of family vacations. Because there's no cell service, everybody "unplugs" to enjoy each other. The people they are actually with. I know, unique concept, eh? It's sort of like fancy camping. We have beds, a fridge and a stove, and bathrooms. But otherwise, no vestige of our civilized lives back in the city. Our days are spent by on the water, in the water, and by the water. We play, we read, we lounge, we swim, we ski and wake board and surf (well, some of them do, anyhow) and tube; we play games and cards and we talk and we focus on the family and friends-who-are-family who have come along to escape with us. Our kids have all grown up with this summer-time trip, and it's so much fun that now they are bringing their kids to continue the family tradition. Getting ready to feed and house 20-some people for a week or two is no small feat. I've handed the getting-ready-phase several ways over the years, but here's what I've landed on as tried-and-true. #1) Start prepping early. As early as I can, I start doing as much as I can. Certainly, some of the food cannot be purchased until the last minute; but by the same token, there is much that is reliably the same from year-to-year, and can be purchased ahead of time; and that's what I focus on to begin with. Because our annual menu changes very little, I have perpetual grocery lists that just need a little touch-up, and then I'm ready to get started. And because we go 40-some miles up lake, it's really important that I don't miss bringing anything essential -- 'cause there's no running out to "pick it up". If I happen to have forgotten the taco shells on taco night, or the milk for the cereal, or the bread for the PB&J, or (God forbid) either the PB or the J; or the syrup for the pancakes, well........let's just say that can't happen! I've learned to divide the lists into categories ~~ meat, dairy, frozen, snacks, deli, breads, fresh produce, etc., cause that tells me clearly what I can buy ahead of time. I make one list for Costco, and one for the grocery store -- 'cause contrary to popular belief (in this household at least), Costco does not carry everything we need. Nor do I want to cart anything extra. It's usually in the neighborhood of 100 degrees when we are on-loading; and the sweat is pouring as we unload everything from the cars onto the dock, then from the dock to the barge, then from the barge to the houseboat. And then I still have to organize it and put it all away. So nothing extra goes along! These perpetual lists allow me to do a "dry goods" run ahead of time (trusting that we are actually in town ahead of time -- that's not always the case). I buy all the snacks, chips, condiments, and paper goods; bring them home and pack them up concisely, and they are Done. I also purchase all the meats ahead of time and freeze them; they are easier to transport that way, and they keep better in those outlandishly hot temps on board the boat. I have a head count by now for each night's dinners, so I know how many steaks or chicken breasts or pork chops to buy for each night. Done. Likewise, all the linens for the boat (there are 4 bedrooms) gets laundered when we come home the year before; then it's labeled, packed in clear plastic bags, and goes into a bin -- so it's ready to go! Each bedroom has it's own bin, and has bed linens, pillows, and towel sets. Done. I have a "kitchen" bin, also, which is stocked with tin foil, dishcloths, scrubbies, some of the spices and meat rubs that I take from home, and miscellaneous things like the kids cups and spare sharp knives. Anything without an expiration date that I know I need every single year gets stored here. This gets re-stocked when we come home, so when it's time to go again, it's already Done. #2) Keep it simple. On the houseboat, it's very much like camping. By the time dinnertime rolls around, everybody is famished, but nobody wants anything fancy. I love to cook as much as anybody I know, but this is not the time or place to be flamboyant. We primarily use the grill, 'cause it's too friggin' hot to try to cook inside. Our standard menu for the week is BBQ chicken; grilled pork chops; steak; my famous brisket (I'll post the recipe! ); burgers & dogs on the 4th of July; spaghetti & meatballs; BBQ ribs; and a Mexican food night of some kind -- fajitas, tacos, burritos, something along that line. For week 2, we start all over again, 'cause it's usually a new crowd, and the only ones who are having it the second time are those who don't care ~ me & Mr. C.
I take tons of fresh veggies, and I purchase those big disposable grilling pans, so we have a big tin of various roasted veggies almost every night. I use whatever I have ~~ broccoli, asparagus, onions, peppers, potatoes, baby carrots, green beans. And the amazing thing is, adults and kids alike, absolutely plow through them every single night. Top with a little olive oil, some garlic salt (this brings out the flavor of whatever it is you're grilling), cover it with foil, and it 30 minutes you can call it Done. I use boxed rice pilaf, Mexican Rice, etc, which can also be cooked on the grill in a skillet. Side dishes are purchased pre-made ~~ potato salad, pasta salad, cole slaw, etc. Lots of summer melons, too. Watermelon, cantaloupe, honeydew. Simple side dishes. Done. I buy a huge bag of those huge baking potatoes from Costco, and I wrap them in tin foil and bake them all the night before. Then, for dinner on the boat, I simply slice them in half and put them face-down on the grill to heat them through. Done. The leftovers get used up as hashed-browns in the morning for breakfast. #3) Don't reinvent the wheel. They've been loving (and looking forward to) this basic menu for years now, so why start all over from ground zero? #4) Say "Yes, thank you" when someone wants to help or contribute in some way. Thank you Janie, R., for your wonderful (and popular!) potato salad, 'cause otherwise I'd just be buying pre-made! The brownies are appreciated, too! #5) Ask the guests what they eat for breakfast, stock it, and forget it. I make dinner happen every night, they can surely make breakfast happen for themselves. #6) Same for lunch. I buy some basics, and the left-overs are always up for grabs, so everybody can have whatever they feel like whenever they want. #7) Always be looking for new tips from others. For example, for years we brought along cases and cases of water and Gatorade and lemonade (no soda!). Had the hassle of hauling it all aboard, and then fought the half-empty-bottle-now-it's-wasted-cause-nobody-knows-who's-it-is deal. Then had to haul all the empties on the ski boat to the garbage drop. But it's so important to stay hydrated when it's over a hundred degrees on the lake, so.........what else do you do? There's not enough fridge space for big pitchers of drinks, which is what I would do at home. Then one time I watched a family loading up huge 5 gallon jugs of water, along with one of those huge beverage coolers. You know the ones I'm talking about, the ones they use for sports, the ones construction workers use; the ones they dump the Gatorade over the coaches head at the end of the game. Those big orange ones. So now we take a big one (10 gal) for water -- we fill it every morning, and add a huge block of ice, and wallah! Fresh cold water all day long, and we set it low enough so even the little ones can fill their own glass. By the way, the little ones all have their own cup with their name on it with a tight lid and a straw. Minimizes spills and waste and lots of unnecessary cleanup. And we take a second, smaller one that I keep in the kitchen; same deal, I make a full jug of Gatorade or lemonade (from the powdered mix) every morning with a block of ice. So much cheaper, easy self-serve, and we are not buried in a mountain of empty bottles. And the adults put their name on their red solo cup to be rinsed out and re-used. Wow, this simple thing has cut down on the hassle coming in and the waste going out! Wish I'd figured this one out years ago, but.....That's why I say, it pays to always keep your eyes open for new ideas! #8) The other thing I do is post a "Next Year" list ~ so as we enjoy our week, whatever we think of that we didn't bring or would like to have had goes on that list -- then I transfer it to the perpetual list(s) when I get home. It's been a really good tool ~ 'cause trust me, I would never remember clear from last summer that we should bring Saltine crackers this year in case one of the little ones gets a tummy ache from too much sun (or too many Popsicles); or Mr. C thought a wind sock would help him as he tries to dock that 70' houseboat with Lake Powell wind gusts; or that hand sanitizer might be a good idea since our water supply is limited. #9) And finally, remember it's your vacation, too. Even though we are (always) hosting, I try to design it so everybody has a good time. Even me & Mr. C.
which is really hard on an enthusiastic blogger! Thanks so much Mary ~ you will have to get a dog-sitter and come along one year ~ you would love it! I appreciate the level of detail you provide and how organized this adventure is! You certainly have it all covered! Leaves time to play with the grand babies, catch up with your kids and enjoy the water toys! Nice article and thanks for taking the time to share these tips with all of us!! The food you serve up is to be envied! But then your cooking always is!! Thanks, Karen. It's a big undertaking, and I've really tried to simplify it through the years. Lots of family memories are created out here on the water, especially because we have time to focus on each other without the distractions of daily lives (and electronics!) ~ it's so worth all the effort!